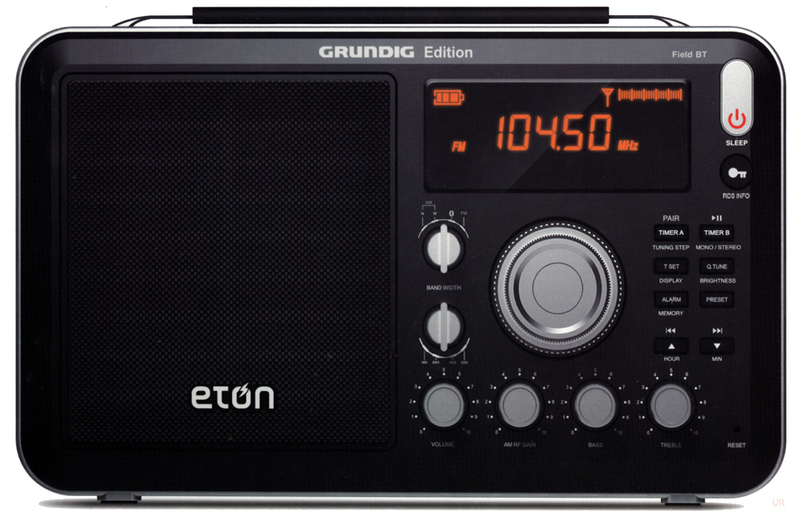 The Eton Grundig Edition Field BT follows on the success of the original Field, but adds Bluetooth® technology to allow you to wirelessly play your Bluetooth® music player or other device through the radio! It receives AM, FM, FM stereo (to earphone jack) and complete international shortwave coverage from 1.7 to 30 MHz. There is a built-in digital clock / timer. This radio features RDS - Radio Data System that enables FM broadcasters to deliver more than just an analog audio signal, but also to transmit alphanumeric data, like the station’s call letters, style of music, song title, artist and more. Separate Bass & Treble knobs tailor the sound to your taste. The memory system stores 50 stations: 10 AM, 10 FM, 10 SW-1, 10 SW-2 and 10 SW-3.